Asakusa (pronounced as ah-sahk-sah) is a district in Tokyo renowned for its bustling Japanese tempura shops scene. This is where couple, Chef Jacob and fashion designer, Celine found their most memorable tempura experience in Japan. 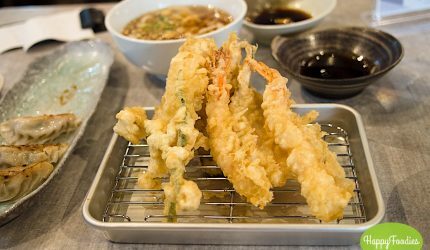 The tempura from a small and simple shop in Japan served by an old couple were one of the best they tasted that they were inspired to bring it in Manila. Hence, Asakusa: Home of Tempura was born in 2015 with its first branch at the Grove by Rockwell. Establishing itself as the tempura specialty house enjoyed by people in Pasig. Two years after, Asakusa opens its doors at Ayala Malls Vertis North to serve northerners in the Metro. The “Goddess of Food”, Ogetsu Hime is offering their Best of Japan selection for a Special Half Price until the 16th of November 2014. Ogetsu Hime is found at the Skypark of SM Aura Premier. 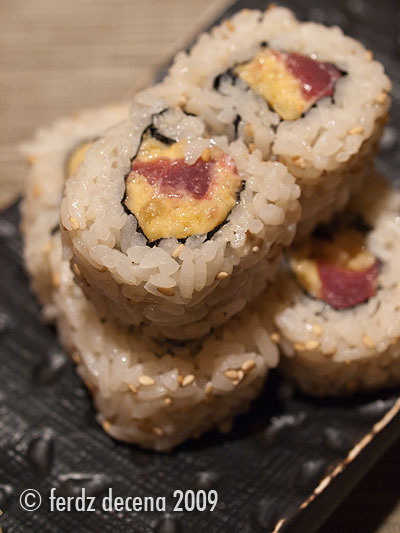 It’s hard not to miss its warm cozy interiors and the sushi bar easily seen by the entrance. 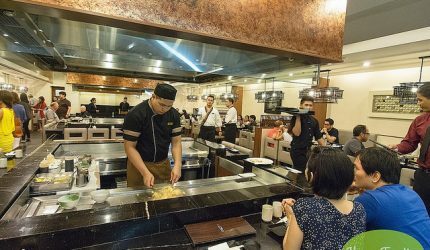 Upon entering, the restaurant is spacious with teppanyaki stations at the center while the sukiyaki-ready tables on the sides. Happyfoodies got to sample the selection of Half Priced offerings and more. We were having a bipolar weather that day. Occasional sun then a splash of rain as we walk towards the Greenfield District at crossing Mandaluyong from Shangri-la Mall. Gone are the market-place vibe and busy transport terminals replaced with a newly revived atmosphere and look with chic and hip restaurants along its spacious manicured lawns. 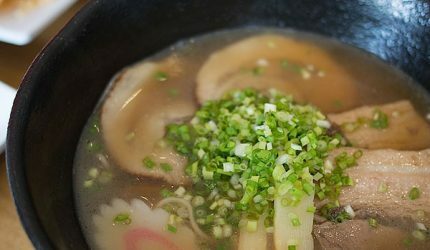 Among the interesting restaurants there is Ramen Bar with it’s steam-bath like theme interiors but serving instead hot steamy ramen that passers by would think twice walking past the restaurant. Happyfoodies with guest foodie Jen have a taste of the new and improved broth from Ramen Bar and other its other tasty offerings. 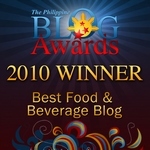 We venture to Mile Long and Makati Cinema Square every now and then and pass the small road leading to Makati Square. We often see the SERYNA signage flanking the side entrance to the Little Tokyo complex and wonder what’s inside. Not that the place has received little media publicity but we always wanted to sample what’s been written about and what the steady stream of diners (evidenced by the endless flow of cars parked on the strip) has been dropping by for. Last weekend, we got a chance to do just that when a trip to another restaurant didn’t go as planned.